There are many ways to create indoor spaces that feel natural and connected with the outside world. The most obvious way to bring the outside in is to physically move plants inside, through dedicated corner spaces, vertical green walls, and productive herb gardens. 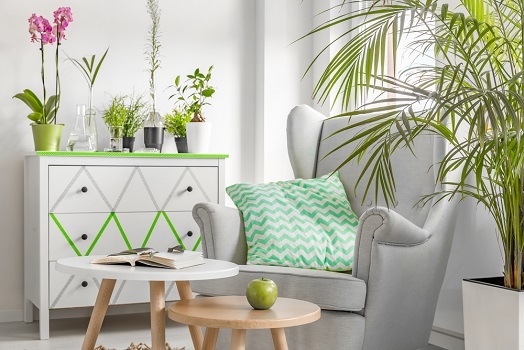 Even the smallest splash of greenery can make a huge difference to how a space looks and feels, with indoor plants known to make people feel calmer and more relaxed. Fish tanks are another great option, with underwater plants and tropical fish capable of bringing life and colour to any space. From doors and windows through to shower partitions and sky lights, the use of glass is a great way to bring the outside in. Glass is a staple of modern design, capable of enhancing flow within a home and making interior spaces look bigger and more connected. Glass doors and windows don't just provide light, they also act as a frame for the outside world. Whether it's an ocean view, an inner-city courtyard, or a great expanse of sky, glass provides people with an opportunity to look outward and expand their horizons. While the inclusion of plants and glass are two of the easiest ways to connect with nature, there are lots of less obvious ways to bring the outside in. Natural fibres, textures, and patterns are capable of transforming indoor spaces, including materials such as wicker, rattan, hemp, and jute. From furniture and rugs through to baskets and lampshades, these materials will make any space feel more natural and relaxing. Natural flooring is also a good idea if you want to feel connected with nature, with wood, cork, and bamboo all capable of providing warmth under foot. Colour selection and combination is a huge aspect of interior design, with different hues capable of radically transforming the feeling of any home. By using colours inspired by the outdoors, you can create spaces that feel natural without getting your feet dirty. Greens calm us by reminding us of earth and plants, with blues inspiring and refreshing us like the water and sky. Reds and oranges provide warmth like the sun, with yellows evoking a sense of freshness and clarity. Thoughtful decorations can also enhance the feeling of natural connection, including fruits and vegetables, rocks and shells, and photographs and murals of the great outdoors.